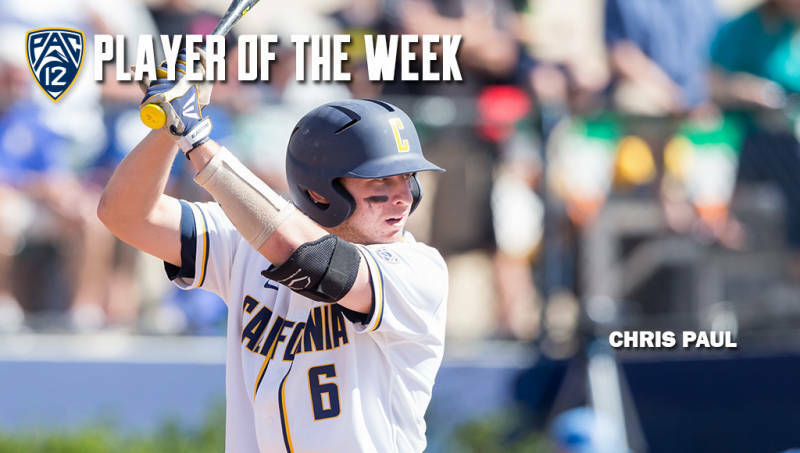 BERKELEY – After batting .700 for the Golden Bears in Cal’s three-game series versus USC this past three day, senior first baseball Chris Paul has been named the Pac-12 Player of the Week. Paul (Aliso Viejo, Calif.) put the Bears on his back this past weekend in the series win over USC, driving in nine runs and going 7-for-10 with three doubles. After two hits and an RBI in an 11-3 loss Saturday, Paul drove in three runs, including the go-ahead run in the seventh to even the series with a 7-5 win Sunday. On Monday night, he drove in five with RBIs in the third, fifth and sixth as a part of a three-hit evening as the Bears captured the series with a 7-2 win. Paul is hitting a team-high .335 with 42 RBIs and eight homers. It was the second conference player of the week honor for Paul this season, as he earned the accolade March 16 after leading the Bears to two-of-three wins over then No. 8 ranked Oregon at Evans Diamond. The veteran infielder was 6-for-10 that week verses Pacific and the Ducks with two doubles, two home runs, six RBI and 14 total bases in four games. David Esquer’s squad is currently 33-17 overall and 17-10 in Pac-12 play. The Bears conclude the regular season May 22-24 at Oregon State.